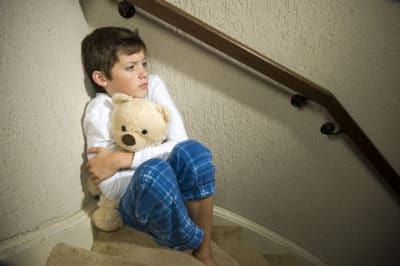 Could your son be depressed? Childhood depression is more common than you may think. 1 in 20 children and teens are clinically depressed. Depression is often masked by other issues. ADHD, anxiety and obsessive-compulsive disorder may all occur in conjunction with depression. Irritability can be a major sign of depression in kids. Sure, we all expect some irritability from our children as they approach their teen years, but a kid who’s constantly annoyed and irritated may actually be depressed. Early diagnosis and treatment is key. Prolonged untreated depression, Sarah writes, can actually change the shape of the brain. If you think your son may be depressed, get him help NOW. (You can find a list of symptoms here.) Help doesn’t necessarily mean anti-depressants, although anti-depressant have been used effectively in children. Help can include cognitive behavioral therapy, coping skills and emotional support. Of course, not all depressed kids require years of psychotherapy or medication. Some kids experience transient situational depression, a natural response to a traumatic event. And some kids are only mildly depressed; with time and attention, their depression may resolve in weeks. Other children, however, struggle with a despair so dark and deep that it feels unending. A professional can help you determine the severity of your child’s depression and plan appropriate treatment. Have you dealt with childhood depression? I’d love to hear your story. I’ve been depressed since I was about 5 yrs old. This is an excellent post. The best advice I’d give is that if your child comes to you, listen. I went to my mother so many times, the feelings were so unbearable, and she’d say,it was b/c I had too much time on my hands, and I needed to get busy. Then she’d make me clean. Listening, always being ready to listen and hold, those are key. Getting to the underlying causes of depression is hard enough in adults, but can be even harder in children. Younger people are not as well-equipped to understand the negative shift in their emotional experiences. There is a certain desperation that accompanies this because they don’t know what is going on, or why they feel the way they do. Unfortunately, that desperation can remain silent and hidden precisely because it isn’t understood by the young person. My point in saying all this is just to point out that parents really need to be aware that childhood depression is a reality and it can hit children and teens very hard. My advice to friends has been to compare physical health to emotional health. If your child has a runny nose, a stomach flu, or a low temperature, you care for them, some time passes, and they get better. But what if your child has had fluish symptoms for four weeks? You get him to the doctor, of course! And you expect to hear that its mono or its time for bloodwork or further testing. You don’t just wait for it to go away. Riding childhood ‘stages’ and teenage waves of puberty is okay when it is short, but when weeks pass and they turn into months, that’s your sign that something deeper is going on, and its time to investigate the child’s emotional health further and care for it differently. Not doing so means your child suffers longer. Best of luck to any of you mothers dealing with this – my heart goes out to you! Be sure you keep yourself cheered up! Really good post, such an important issue. I am sure there are many boys (and girls) out there who are not getting the help they need, not because caregivers don’t care, but because they don’t know. I think the analogy to prolonged flu symptoms is very helpful, thanks Tatiana. This is an important post! Childhood depression often goes undiagnosed and can have devastating long term consequences. Parents need to be educated about the symptoms, so that they can act as advocates for their children. Fortunately, there is a lot of good research being done in the field of childhood depression and there are effective treatments available. A great place for parents to get information about the best, science-based treatments – in easy to understand terminology – is http://www.effectivechildtherapy.com. It is sponsored by the American Psychological Association and has helpful facts on symptoms and treatment that parents need. The site also offers information about how to find local therapists who specialize in therapy to treat depression. My youngest was. when he was about 6 I noticed it, but figured he was just ‘moody, sensitive, dramatic’. afterall, he was ONLY 6! had a great life, loving family, loving church, (was homeschooled- no peer pressure, etc).. how could he really be depressed. I saw an add for childhood depression and knew they were talking about my son, so I took him to a behavioral therpist, but AFTER I had him evaluated for Sensory Integration Disorder and eliminates some hidden food allergies. those things helped, but he was still having trouble.